Even before the Farnsworth Art Museum opened its doors on August 15, 1948, it had already set a goal to build a collection of American art whose subjects reflected the daily experience of Rockland’s residents: the land and the sea, and scenes of work and play. Thus the museum’s earliest acquisitions often depicted the harbors, streams, fields, and forests of Maine, and boat builders, fishermen, farmers, and vacationers along the state’s scenic coastline. Since the mid-nineteenth century all of New England has been both host and inspiration to many of America's most noted painters including Thomas Cole, Fitz Henry Lane, Alvan Fisher, Sanford Robinson Gifford, Martin Johnson Heade, John Frederick Kensett, Thomas Moran, and George Inness. What these and other artists experienced was an American nation that spread itself across the continent, a place that was defined by remarkable natural wonders as well as human transformation of the land and its bounty to serve people's needs. 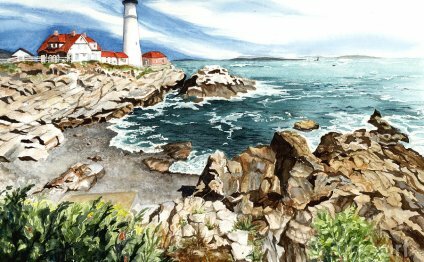 Places such as Niagara Falls, the Rocky Mountains, and Maine’s own scenic wonders all found their way onto artists’ canvases—now part of the museum’s collection. In Maine, the arrival of the railroad along with travel by sailboat and steamer brought more and more visitors to the state. Lane's painting of the Camden Mountains, or Gifford's of Mt. Desert Island, or John Joseph Enneking's of Mount Kineo from across Moosehead Lake captured the allure of the spectacular places increasingly accessible to America’s leisure travelers. In the summers especially, those with the necessary means were able to escape ever more populated Philadelphia, New York and Boston, and other east coast cities for these attractive sites. A critical issue for many American artists in this period was how they defined themselves in relation to their European counterparts. American Impressionists adopted from Monet and his French contemporaries their free handling of paint, vibrant color, and the very notion of painting outdoors rather than in their studios. The Farnsworth’s paintings by Joseph DeCamp, John Twachtman, Childe Hassam, Willard Metcalf, Frank Benson, and Bruce Crane exemplify the strong hold French Impressionism had on American artists.